If you're in a hurry, you simply need to know that the PlayStation Vita is a very good portable video game machine that excels in ways that Sony hasn't bothered to hype. I recently had the opportunity to look over the shoulder of a teenage boy who was playing some poor man's unauthorized version of Rockstar's hit Western, Red Dead Redemption, on an iPad. He was struggling to get his cowboy's horse unstuck from a man-sized bullseye target it had trotted into. The target had been propped up in some orange and brown canyon for part of a shooting challenge that had clearly gone awry. The boy's problem was that he couldn't get the horse to back up. It appeared that the game's controls were malfunctioning. The game was on an iPad, so its controls were, of course, all touch-screen. There was no back-up-the-horse-button. There were, since this was an iPad game, no buttons or control sticks at al. The game's developers had done what many people who make iPad games do: they had created virtual buttons and sticks. They required the player to put their fingers on parts of the iPad's glass screen and slide them around as if they were touching things that weren't there, simulating the presence of one, maybe two analog sticks. In this Western, the simulation was clumsy. The boy's thumbs twiddled on the virtual sticks. The horse stayed stuck. So the boy had to restart his mission. I watched this happen on flight from Las Vegas to New York. The boy was in an aisle seat, across and one row up from my own aisle seat. He had an iPad. Everyone had an iPad. To my left, in a sign of the machine's borderless ubiquity, there sat a man whose iPad was in Chinese. He played soccer games and virtual card games during the flight. To his left was another man who also used his iPad in Chinese. He played games on his, too. I kept my iPad in my bag during that flight. I had a PlayStation Vita to play. When you have a PlayStation Vita to play, you look at people like the boy with the badly controlling wannabe Western and you just… well, you pity them. The PlayStation Vita is Sony's second portable gaming system and easily its better one. It arrives here in North America as well as Europe and Australia on something of a timer, as the rise of gaming on iOS and Android devices threatens the relevance of dedicated handhelds much the way Sony itself threatened the dominance of Nintendo's near-monopoly on dedicated handhelds more than half a decade ago. It was no surprise that I was outnumbered by iPad gamers 3:1 on my flight from Vegas, and not much of a surprise that there was nary a Nintendo 3DS nor PlayStation Portable-that first Sony handheld-in sight. Those of us who choose to play games on machines made for playing games are discovering themselves to be a minority. If the Vita is going to be an argument for the worth of dedicated handhelds, then it is a nearly perfect argument. This new machine is an extraordinarily capable device—for gaming. It already rivals its handheld peers and even home consoles in terms of quality gaming experience. It sparkles not just because of its hardware but because of its services, which even on Launch Day Minus 1, are already some of the best-engineered in the medium's history. Let's start with the hardware. We've got a beautiful five-inch screen and two analog sticks. The former is almost too generous. It makes games look beautiful but also renders the machine too large to fit comfortably in any pocket but an inside jacket pocket. The sticks are squat enough not to get snagged or snapped when you tuck the system in a bag but have enough range for deep analog control. This combo, along with four face buttons, a d-pad and two shoulder buttons gives the Vita most of the gear it would need to run any console gaming genre—from sports, to first-person shooters, to RPGs. This new machine is an extraordinarily capable device—for gaming. The Vita is light and quiet. It may initially give the impression of being inconvenient due to its size, but its low weight and lack of a disc drive lower the machine's profile. It effectively melts away while you're playing it. Games run off of thumbnail-sized cards that are so physically insubstantial that I already had to rescue one from the laundry, since I forgot I'd put it in a shirt pocket. Most games can be downloaded to the machine, if you prefer. Games and any other downloaded content are primarily saved on a memory stick, available in various many-Gigabyte sizes. The memory cards are the Vita's most notable hidden cost. The build of the hardware feels solid and less fragile than I'd feared. I've had a succession of two Vitas since December, first a demo unit and then a real unit, and I've been fairly rough with both of them, tossing both into my bag, carrying one frequently in a jacket pocket. I've never paired them with car keys nor dropped them, but I've also not coddled them or encased them. So far, they're holding up. The Vita's battery life will be a problem for forgetful people. The machine is holding only about 4-5 hours of battery for me, with Wi-Fi enabled though not always active. The machine is so well-networked through online services that you wouldn't want to deactivate Wi-Fi, to the extent that that saves power. But the battery life in this thing should be fine for the average commutes or non-plugged-in-session as long as you plug the thing in to charge when you get where you're going. Don't forget! The Vita has a Swiss Army Knife's worth of other entertainment features, which all go in the category of Nice to Have, I Guess. It's striking how little a description of the Vita's hardware conveys the actual, positive experience of playing games on the thing. Not since the launch of the Xbox 360 with its Achievements system and revision of Xbox Live has a gaming device been bolstered so much by well-implemented services. The Vita cribs from some of the smart things done with Nintendo's evolving 3DS networking systems. It blows away the primitive iOS Game Center (if not the App Store). Most significantly, it outshines Sony's own services on the PlayStation 3. In fact, the Vita's services and online implementation is so slick, it has finally made my PlayStation Network friends list matter to me. Playing the Vita is designed to feel like a perpetually social experience. Who you are and who everyone else is matters when you're using the Vita, because playing the Vita is designed to feel like a perpetually social experience. The Vita supports the same PlayStation Network ID you might also have for a PlayStation 3. With my ID entered, I can go to a program called Near which will scan a several-mile radius and show me icons that represent various people who have played games near my physical location. I can friend these people, check out the games they're playing and even leave them gifts for unlocking stuff in games (they can do the same for and to me). I have a few friends who already have Vitas and live within a few miles of me, so their icons show up. When I was in Vegas for a gaming conference, I could check out the gaming habits of developers and a Sony executive, who were keeping themselves amused with their new Vitas. Your PlayStation ID also gets you into the system's online shop, which is remarkably easy to access and, like all the apps on the Vita, surprisingly fast. Content on the shop loads quickly, and what a great array of content it is. You can download any first-party (Sony-published) Vita games already, all of them meant to be available, going forward, on the same day as retail launch. You can also download a few dozen PSP games, some smaller games called Minis, as well as movies and TV shows. The games can be huge, easily over a Gigabyte, but they can be downloaded in the background while you do other things on the system. The Vita screen may be larger than it needs to be for games, but for navigating an online shop, it's wonderful. As you're using the Vita, you get lots of notifications. All of them reside in a list that springs up if you tap the upper right corner of the screen. During my typical sessions with the Vita, I'd get notifications about PlayStation friends who had just signed on, games that had just finished downloading, Trophies I'd unlock and messages I'd received. Notifications popped up quickly and clearly. Maybe this sounds annoying, but it wasn't. It felt like I was part of a machine that was connected in all the right ways to the rest of the PlayStation gaming and entertainment world. You can use the Vita as a video player, which it does a fine job as. You can also use it as a music player, which, honestly, I haven't even bothered to try, as that feature seems meaningless to me and my music mostly remains locked to iTunes (which isn't supported here). The Vita is no more likely to be your music player of choice than it is your camera, which gives me a good segue for warning you to not use this thing as a go-to camera. It can shoot stills and videos, but not as well as my iPhone 4. The camera is fine for augmented-reality games that make game characters appear to float through the real world, but as a thing to take beautiful pictures, it's not up to snuff. The better apps in the Vita are things like Near as well as a convenient text-messaging system for PlayStation Network users and a Party system that enables cross-game chat through the system's speakers and mic. The best thing about the Vita's apps is that you can have many of them going at once—even while you're playing a game. When I tested the system's Party feature by chatting with the afore-mentioned Kirk Hamilton, we were (eventually) able to also both run a full Vita game, WipEout simultaneously. When the game notified me that I had to redeem a code on the PlayStation Store in order to play the game online, I was able to leave WipEout without quitting it, keep the Party chat going, jump into the store, redeem a code and go back to the game. Not only did the apps all run, but I had others idling in the background and nothing stuttered. Nothing slowed down. The Vita had the horsepower to juggle all of this. This the experience I'm breathless about: the Vita isn't just providing attractive, high-end gaming on a beautiful screen but it's able to do that while running several other applications that are useful to a gamer at the same time. The appeal of the network features only goes as far as your network connection extends. The appeal of the network features only goes as far as your network connection extends. I have a Sony-supplied 3G Vita, but I do not have a SIM card for it. So I'm playing this $300 machine as a $250 Wi-Fi unit. At home, I get the full experience I've described so far. But on the go, or on a plane from Vegas, I only get the benefit of asynchronous networked experiences. I get the unlocks earned by connecting to Near. I get the most recent friendly game-score challenges that were sucked into my system the last time I was online. This might make you think the 3G unit's ability to be perpetually connected beyond Wi-Fi hotspots would be preferable. But for a subway commuter like me, 3G wouldn't help much. I'm likely to use the Vita a lot at home on Wi-Fi, which will, of course, put it in competition with my home consoles. Or, at least, I'll probably spend a lot of time setting up my Vita at home before my next commute, downloading games, syncing stats with friends and so on. So, what of the games? They're the typical mixed bag you get when a system launches. There's no Halo or Super Mario 64 among them. There is no instant classic. We will review several major Vita games, and I'll let those write-ups sift the winners from the losers. I will say here, however, that games such as WipEout, Super Stardust: Delta and Uncharted: Golden Abyss attest to the Vita's horsepower. This machine is a beast. It can run games at smooth framerates with the kind of visual detail that, at worst, matches the best of the iPad and comfortably surpasses older home systems such as the PlayStation 2 or Wii. The games look Xbox 360 or PlayStation 3-esque, though the more you gaze at them, the more you can tell they're not quite at that level. I've found myself gravitating toward an odd collection of games on my Vita that suggest I'll use this machine differently than I'd thought. Specifically: I thought I was going to be using my Vita to play Vita games. Its excellent online store, however, has made it a cinch for me to stock up on PSP games, and now I've got that older system's Patapon 2 and Tactics Ogre—downloaded legitimately—just waiting to become my main Vita games. Wait. Not so fast! I never got a chance to play much of last year's well-regarded Rayman: Origins, a gorgeous side-scroller I have for my PS3. I now have it for Vita, and it seems to look exactly as good on my Vita as it did running on my TV through the PS3. What we've got here in the Vita is a system that is reaching into the domains of other Sony gaming devices and repurposing that content into a format that is much more convenient for a commuter like me. This is what you get when you have a gaming machine that is both powerful and well-connected to an online store stocked full of substantial games. The Vita could be the PSP all over again. Sony pitched the idea of console-quality portable games with its PlayStation Portable. It produced a respected system in the PSP, but one that most Western game developers abandoned early, blaming piracy though a stalled market in the West, where Japanese smash hit Monster Hunter hadn't caught on didn't help. Maybe Western creators won't stick around on the Vita for long, either, especially if they're still chasing gold on iOS. The Vita could once again not be sufficiently different from a PlayStation Console. Sony itself might again find itself recycling too many of its popular console games onto its handheld and fail to strike upon its own Pokemon, WarioWare, Advance Wars, Mario & Luigi or other best-on-handheld series that rival Nintendo uses to keep its handheld system fresh. Nintendo has been able to establish its handhelds as something separate from its console; Sony hasn't made as convincing a justification to non-wealthy consumers yet. The Vita could simply be one too many devices to carry around for people already loaded up with some combination of smartphone, laptop, tablet or 3DS (the last of which is entering its second generation of much better software than what it had at launch). This is indeed, the most powerful and physically capable gaming handheld ever made, one sold for a reasonable price and that supports both the buy-games-at-a-gameshop lifestyle and the download-everything one. It's a connected device that will run classics (eventually from the PlayStation 1, too) and modern games. The Vita has the support of some third parties Japanese developers and, more importantly, the vast assembly of in-house developers in Japan, North America and Europe who have given Sony the ability to regularly turn out very good games under their own label—they also are likely to have better support from their Japanese studios who've been overwhelmed by the scale of PlayStation 3 development but seem perfectly suited for Vita game creation. Until you reach your fifth hour of consecutive gameplaying on the Vita, there is nothing unpleasant about the machine. If there was a Western on the Vita, and if your character in the game found himself on horseback deep in a canyon, walking into a target, you'd be able to back that horse up. The Vita has the sticks for it, and the Sony people making games for it? They have that kind of sense. 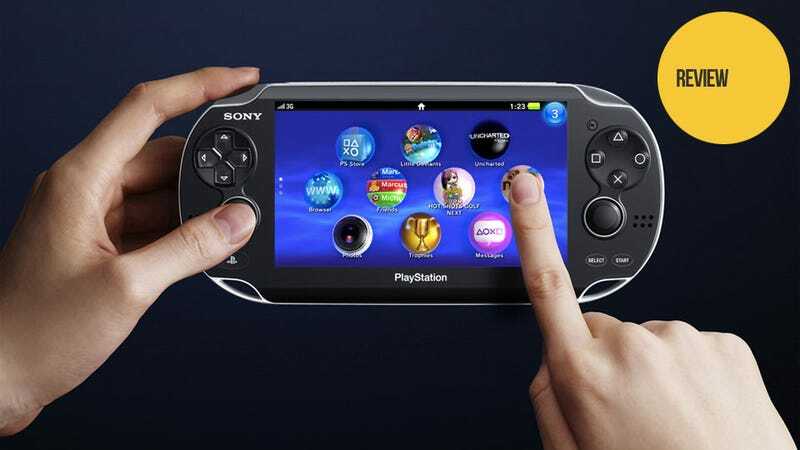 The PlayStation Vita will be available widely in North America on February 22. The 3G unit costs $299.99 and can be purchased early on the 15th. The Wi-Fi unit runs $249.99. The essentially-mandatory memory cards run from $20-$100.